When news of the Odell Beckham Jr. trade hit the wire, it sprung a motherlode of reactions across the NFL sphere. But don’t overlook the effect it will have on the NFL draft, and not just for the principle teams involved, the Cleveland Browns and New York Giants, but also for the rest of the league. A second major trade, the Kansas City Chiefs sending Dee Ford to the San Francisco 49ers, also will have a huge draft tie-in come April. Together, these trades put the 2019 draft in the spin cycle. After that Gettleman did, however, leave the door open to the Giants taking a quarterback high – it just wasn’t clear at the time if the Giants, picking at No. 6 overall, would be able to do so. They lacked a third-round pick (spent on supplemental draft cornerback Sam Beal last summer), and looking at the five teams ahead of them, there didn’t appear to be a natural landing spot outside of the second pick, owned by the 49ers. But now that the Beckham trade has gone down, Gettleman’s words at the combine have taken on a whole new meaning. The Giants are in full rebuild mode now, even with the reigning Rookie of the Year in Saquon Barkley on the team. They have nearly $34 million in dead money on their salary cap and serious holes in a lot of spots. Now has to be the time to make up for the missed opportunity in last year’s draft to have found 38-year-old Eli Manning’s successor. When it was noted that he’d never in his career drafted a franchise QB, Gettleman properly noted two things: One, that he’d been blessed with great quarterbacks – namely that he walked into the Carolina Panthers job with Cam Newton already on board and how he was on the Giants staff when his mentor, former Giants GM Ernie Accorsi, did just that in drafting Manning. Accorsi gave up draft picks, big ones, and traded up to get the quarterback. Is Gettleman bold enough to do the same? How high can the Giants get for a QB? Now they have the picks. You can argue whether or not the Giants got fleeced in the Beckham deal until your face turns the team’s colors. But they have the Browns’ first-round pick (17th overall) now, along with a third-rounder, believed to be the 95th overall pick. That, along with the rest of what the Giants have, should be more than ample to get a quarterback if one tickles Gettleman’s fancy. Let’s assume for a minute the Arizona Cardinals take Oklahoma QB Kyler Murray No. 1 overall. (That’s far from decided upon, but let’s say the Giants believe that’s going to happen.) The smart money then might be on Ohio State’s Dwayne Haskins as the apple of their eye. A generation ago, Haskins never would be the Giants’ guy, given that they subscribed to a stringent draft philosophy of not drafting one-year starting quarterbacks, such as Haskins, that high in the draft. 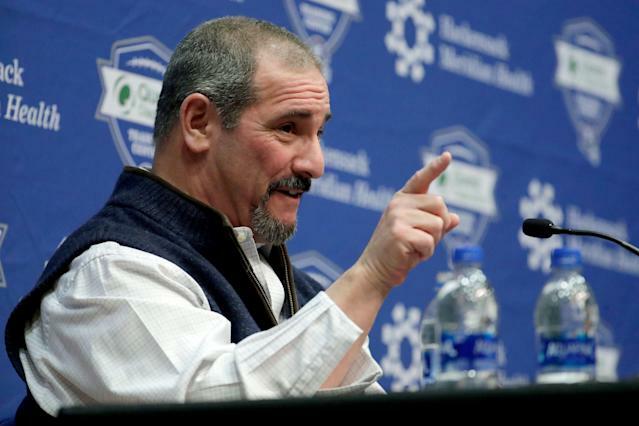 Gettleman has admitted to altering some of his philosophies since his first Giants tour of duty, and it’s hard not to think that watching the success of Newton – also a one-year Division I starter – had to tilt Gettleman’s thinking on that. In our most recent mock draft, Haskins was slotted at No. 6, and that certainly could happen, but things have changed a lot since then. The Giants quietly have done a fair amount of work on Missouri’s Drew Lock behind the scenes, and the connections to Duke’s Daniel Jones, who was coached by the same man who mentored Manning (David Cutcliffe), make him an easy candidate to mock to New York. Back to the 49ers now. They’re sitting in the No. 2 slot, which could end up being the catbird’s seat when all the dust settles. Murray’s pro day is Wednesday, and it could start the ball rolling in earnest on him landing in Arizona. Perhaps that puts Josh Rosen on the block, opening up another option for the Giants. But if they didn’t like him enough to take him at No. 2 last year, selecting a running back instead, what’s to make anyone think they’re going to assume he’s Eli’s successor? If Murray goes first, the 49ers have their pick of the litter to fix a bad defense. But that’s the single-pane view. If they’re smart and play their cards right, the 49ers could get that elite defender and even more draft-pick bounty on top of it. Swapping picks with the Giants at six could net them additional selections and allow them to pick their favorite remaining defender, with Ford helping fill the big void of a pass rusher they so badly needed. The Giants might be compelled to jump ahead of the Raiders – always a threat with three first-round picks – who sit at No. 4 overall and vault up to No. 2. Sure, they’d be hesitant to give away that No. 17 overall pick, but you have to correct your mistakes and not fear the price at this point if Gettleman believes in the right quarterback. So if it’s Murray and, let’s say, Haskins going 1-2, that would leave only three more teams ahead of the 49ers – the Jets, Raiders and Buccaneers. The worry would be that those next three picks could be Ohio State’s Nick Bosa, Alabama’s Quinnen Williams and Kentucky’s Josh Allen. Bosa is believed to be the Niners’ top option, and they were really bummed, we were told by people who know, that Allen backed out of coming to the Senior Bowl, where they had made it a point to the game’s officials that they wanted Allen on their North Team roster. Maybe then they’d have to move up to the third spot, where the Jets are said to be draft sellers, depending on what unfolds the rest of free agency. Or maybe the Bucs at No. 5 would be open for business. Either way, the 49ers might deem that move worth the risk in the long term. The team that has dominated the draft, for better or worse the past several seasons, is suddenly an afterthought come April 25. In fact, the Browns don’t currently pick until Round 2, No. 49 overall. What a wild turn of events, the Browns sitting back with their legs kicked up in the war room. Crazy league, this NFL. Don’t look past the Sheldon Richardson signing as a subtle butterfly wing-flap in this chaotic game of dominoes. The Browns landing Richardson and filling a big hole at defensive tackle likely gave Dorsey peace of mind he could swing the Beckham trade. Sure, the Browns still have work to do on the roster. Jabrill Peppers was sent to the Giants, opening up a spot at safety, and they could use another cornerback. They also are thin along the offensive line following the previous Giants-Browns trade, which sent Kevin Zeitler to New York and Olivier Vernon to Cleveland. But all arrows pointed toward the Browns taking a defensive tackle at No. 17. With that need settled, the Browns could afford to be bold in landing Beckham. The Beckham trade, and, to a lesser degree, the Ford deal have recast the fortunes of three teams in a significant way. But they also undeniably have reshaped the draft, especially at the very top. Thought this might not be an exciting draft after last year’s QB bonanza? Think again. You can almost guarantee that Tuesday’s flurry of activity will have a major effect on how the first handful of picks shake down, and that in turn will have a ton to say about the futures of the quarterbacks with the Giants or Raiders or maybe some mystery team. As a result, these next six weeks until Draft Day should be a blast.